Alain Vigneault is a Canadian professional ice hockey head coach for the Philadelphia Flyers of the National Hockey League (NHL). 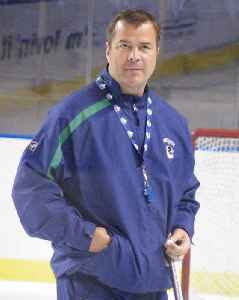 Vigneault has previously coached the Montreal Canadiens, Vancouver Canucks, and the New York Rangers in the NHL, as well as in the Quebec Major Junior Hockey League (QMJHL). During his career with the Canucks, he won the Jack Adams Award as the NHL's top coach of the year in 2006–07 and has become the team's record holder for wins as a coach. Under Vigneault, Vancouver won back-to-back Presidents' Trophies and made one Stanley Cup Finals appearance (2011). In his first season with New York, he led the Rangers to their first Stanley Cup Finals appearance (2014) in 20 years.